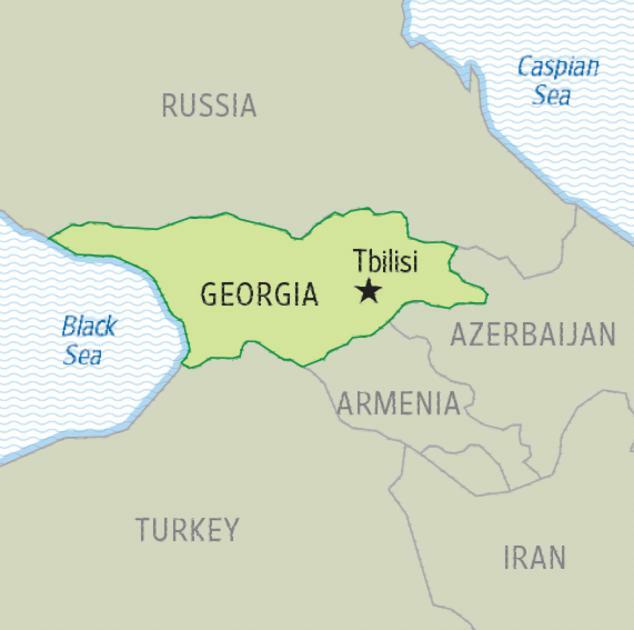 Not long ago, few Western travelers ventured to Georgia, a former Soviet republic. Now its newly polished capital city, Tbilisi, is shaping up to be the life the party, wall street journal writes. BY 10 P.M. at Ezo, a restaurant set in a garden between flaking art nouveau facades, confetti strewed the grass. The wooden tables were soaked with remnants of beer, Turkish coffee and wine. Toddlers dodged table legs, while a teenager with blue hair and multiple piercings kissed another in a leopard-skin coat. In Tbilisi, the capital of the former Soviet republic of Georgia, parties like this one—celebrating Ezo’s first anniversary—appear to be a regular occurrence these days. Every member of the city’s urban bohemia seemed in attendance. An Armenian journalist I’d worked with a few years back suggested a drink somewhere quieter; I agreed. The only trick was to figure out which of the places we remembered still existed. In 2010, when I first moved to Tbilisi, a city of about 1.2 million people, it had few cafes like Ezo. Other than a string of seedy cheap-beer dives frequented by backpackers, the city’s most popular bars were characterized by a slightly dilapidated, Russian-businessman glitz. I rented my two-bedroom apartment, with a terrace and views of the 4th-century Narikala fortress, for $400 a month. To reach the traffic-clogged main square in the Old Town or the main bazaar across the moss-green Mtkvari River, I had to dodge feral cats, turning through alleys thick with sawdust, tripping over loose cobblestones. I bought my bread—dough thrown against the walls of the stone ovens—from an unmarked bakery underneath the 19th-century brick seminary. I gathered up my pomegranates and figs from the small markets in subterranean underpasses, where fruit-sellers and purveyors of used clothes hawked their wares to the sound of traffic horns overhead. I fell in love with the city’s strangeness, even if I cringed at the chaos. How could one of then-President Mikheil Saakashvili’s skyscraper projects shoot up seemingly overnight, while the renovations on Rustaveli Avenue’s Moorish-style Opera House remained “very nearly completed” for almost half a decade? After several years away, at graduate school in Oxford, I returned to visit a few months ago to find the Tbilisi I knew a different city. My local teahouse is now a Georgian wine shop, catering to the tour groups that mill around the rose-perimetered Aliyev Park. The Meidan, the main square—newly paved and painted in pastels—looks, at first glance, implausibly tidy. Today’s Tbilisi appears less raucous, less anarchic than the city I first fell for, but it has a relentless, youthful energy that feels no less thrilling. The best cafes—like Ezo, like Le Toit, off Kote Abkhazi street—are either unmarked or on the upper floors of art nouveau apartment buildings, filled with Victorian-vintage clutter (scattered gramophones, teapots). These aren’t the gaudy, Plasticine “VIP bars” that lined Chardin Street in 2010, catering to businessmen of dubious provenance. They feel makeshift, just barely cobbled-together—and new. Nightclubs such as Bassiani, in the basement of the Dinamo football stadium offer exhilarating late-night dance spaces in converted swimming pools and repurposed Soviet seafood restaurants. 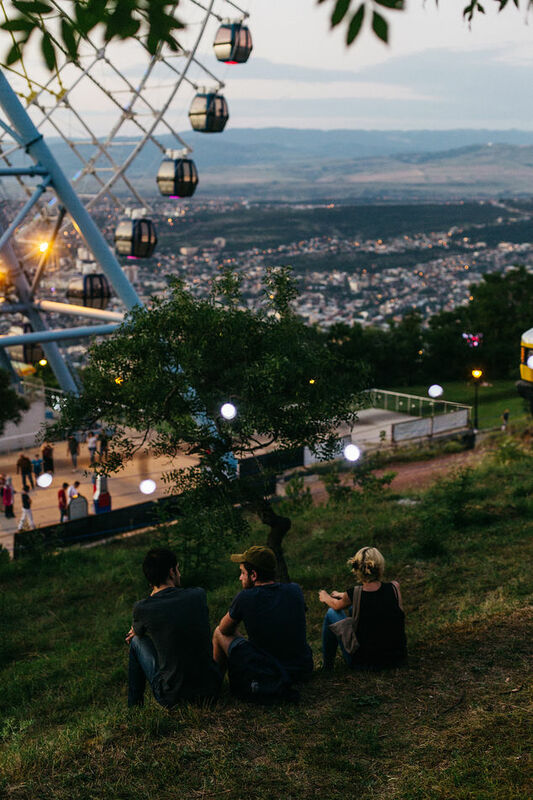 The old amusement park on the hill of the Mtatsminda district now hosts open -air parties. At Fabrika, a Soviet factory turned hipster hotel-slash-gallery space nestled on a back street, splendidly colorful graffiti lines the walls. Down the road, the new restaurant Barbarestan—fully booked even at four in the afternoon—serves classic Georgian dishes lifted from the recipe-book of 19th-century Duchess Barbare Jorjadze. Underneath my old apartment’s windows sit 18th-century bathhouses, and beside them, several new restaurants overlook a recently excavated canal. Last year, Khasheria, the latest offering from Tekuna Gachechiladze (one of the country’s best-known chefs) opened up, turning out contemporary, delicately spiced takes on traditional Georgian comfort food. The signature dish: khasha, or beef tripe soup, that Georgians swear by as a hangover remedy (here, it’s served in a piquant broth warmed with a garlic-and-chili ajika sauce). Communal tables line the walls; the décor exudes a minimal post-industrialist-chic, more artful than Soviet. Still, some quintessentially Georgian eccentricities remain: When I plugged in my laptop at Khasheria, the entire outlet fell out of the wall, revealing a tangle of bare wires. The waiter shrugged, plugged it back in, and shoved the mass of exposed metal back into the wall. It worked. On my last day in Tbilisi, I walked along the Dry Bridge: the overflowing weekend flea market where the same vendors I recognize from 2010 sell Soviet pins and Russian silver, icons and enamel, daggers and fur hats, and an array of ram horns (hollowed out and used for downing wine in a single gulp). Back then, the flea-market aesthetic was firmly outdated, targeting stray tourists or old women scrambling for deals. But today, impossibly fashionable Georgians in their 20s—wearing silk capes and ankle boots—were trying on enameled pendants, vying with backpackers for bargains. I crossed the street to Saarbrucken Square at the eastern terminus of Agmashenebeli Avenue, the main boulevard of the city’s right bank. Last time I was there, the street was a crowded mess of splintered, balconied buildings, honking Ladas and gaudy wedding-dress shops. Now, it’s pedestrianized, and the newly smooth cobblestones were bordered with baskets of yellow flowers and historic photographs, and advertisements for Georgian brandy and wine. Women in traditional dress sold croissants and khachapuri—the ubiquitous Georgian cheese bread—side by side on long tables. The ruins of a church held a photography exhibition. A festival with panduri-strumming musicians was well under way. The gargoyles and the corbeille angels on the art nouveau buildings had been restored: Perfectly chiseled stone reliefs now hung over facades painted cerulean and magenta. “The party is for the new street,” one of the khachapuri-sellers told me. The renovations on Agmashenebeli had just finished that day. Everybody was celebrating. It looked nothing like the city I knew from seven years ago. I loved it anyway. Jazz music blared in the square, then Edith Piaf; people hummed along. I hummed, too, walking on. Staying There The Rooms Hotel, located in a converted publishing house in the leafy Vera district, is the city’s trendiest hotel. Tbilisi’s better-heeled bohemians hold court in its library-themed lobby (from $140 a night, roomshotels.com). You can find more traditional—and cheaper—options among the city’s family homestays (more involved versions of the bed-and-breakfast experience) such as Tina’s on Sulkhan-Saba Street, just off Freedom Square (from about $17 per person per night, tbilisihomestay.com). Eating and Drink There The best traditional Georgian restaurants offer elaborate multicourse affairs, with live music and folk dancing. Head to the edge of town to the gardens and gazebos of Phaetoni for sour-plum-sizzled shashlik (tiny shish kebab) and a coriander-topped bean stew, plus boisterous entertainment (Akaki Beliashvili St.). For a taste of modern Georgian fare, head to Tekuna Gachechiladze’s Khasheria (23 Abano St.) or her older Café Littera, on the grounds of the art nouveau former Soviet Writers’ House, where the seasonal menu includes inventive takes on Georgian classics, like trout tartare served with spicy ajika or creamy, walnut-puréed eggplant salad (13 Ivane Machabeli St.). 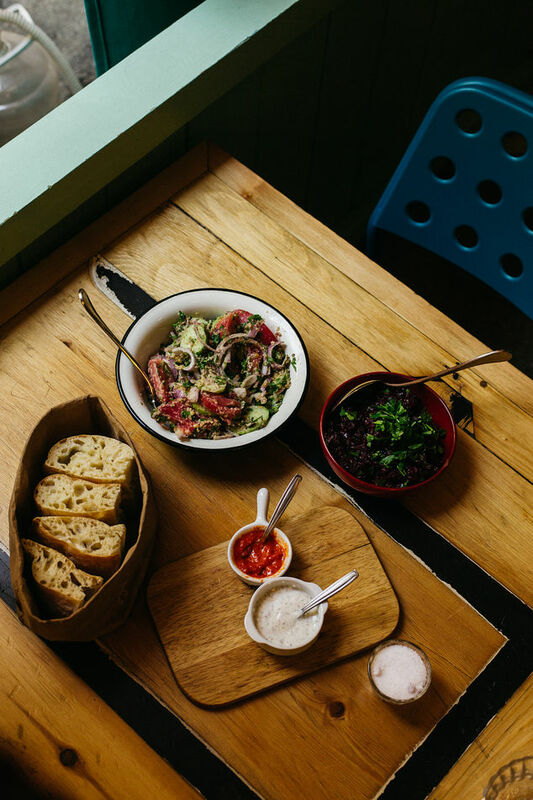 Ezo, a typically raucous garden restaurant, focuses on locally sourced, sustainable regional food (16 G. Kikodze St.).